The Super Bowl is over and the stadiums across the country that once held thousands of fans on any given Sunday will be mostly empty in the off-season, but Tom Brady is still at work. The quarterback who will undeniably go down in NFL history as one of the greatest of all time is already thinking about his next act. Alongside Michael Strahan (another football great who has made the transition into pop cultural icon) and Gotham Chopra — the producer, director and former war correspondent — Brady is launching a new sports media startup. Called The Religion of Sports, the new startup, which is seeking around $3 million in outside capital, is neither The Players’ Tribune, Derek Jeter’s media platform for athletes to tell their own stories, nor TraceMe, Russell Wilson’s access-focused app for athletes and celebrities. Instead, Brady, Strahan and Chopra, alongside chief executive Ameeth Sankaran, a former investor with a family office out of Texas and longtime friend of Chopra’s, want to create a multi-platform storytelling business that functions like an old-school studio — dedicated to sports — that tells the best stories in the medium that’s most appropriate for them. If this seems like a thesis in search of a technology platform, that’s because it is — but it’s impossible to discount the Rolodexes that Strahan, Brady and Chopra (the son of Deepak Chopra) have on hand and the power that their network can wield. It’s also impossible to discount their dedication to sports… and the stories that can be told through the lens of players and their fans. For Strahan, who has already made the jump to becoming a capital “C” celebrity, this is another hyphen to add to his multi-hyphenated career of all-star-talk-show-host-business-mogul, but for Brady, who may retire as soon as the end of next season (if the Pats make another Super Bowl appearance), there’s definitely a sense of what will come next. The crew first came together around five years ago when Brady met Chopra in Los Angeles. Strahan had enjoyed a long-standing friendship with Brady and through mutual friends was connected with Chopra, who floated the idea of the company to him. The idea resonated. “I love the storytelling aspect and being able to produce content that’s different and inspiring,” Strahan wrote in an email. 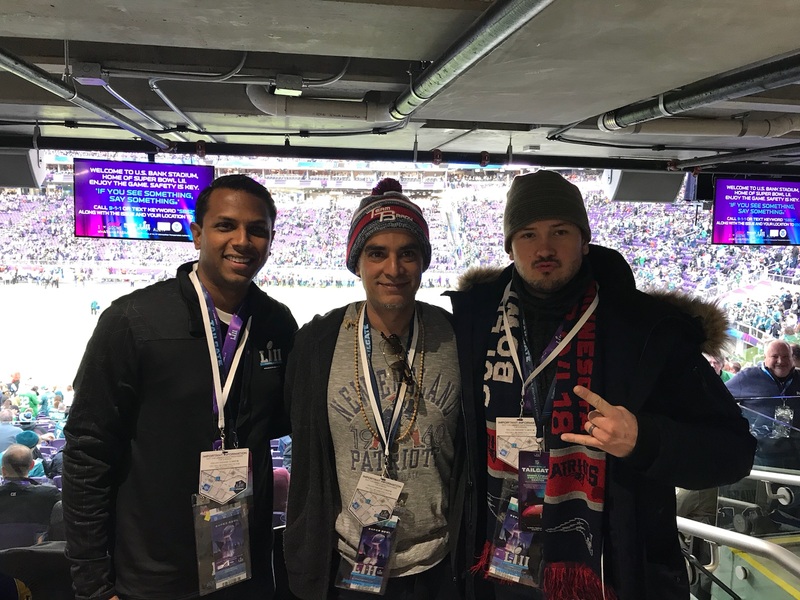 While both Brady and Strahan are among the greatest athletes to play the game of football, Chopra brings the eye, and mind, of the ultimate fan. For him, the inspiration for the company goes back to something out of a Norman Rockwell illustration. Picture an immigrant father and his young son sitting in the stands at Fenway Park, watching the Red Sox take the field. That experience, and the sense of community that it instilled, became a focal point for the younger Chopra and a theme that would recur again and again in his work. Over a succession of Diet Cokes at the Beverly Wilshire Hotel one afternoon earlier this year, Chopra and Sankaran laid out their vision for the company. Think of it as a new media contender to old line properties like ESPN — with celebrity athletes and producers driving the creation of new properties. “We’re hearing in the marketplace an openness for experimentation [and] we’re willing to be innovative around what a business model will look like,” Sankaran says. For Chopra, sports is the ultimate non-denominational church, and the narratives that are spun through its lens around mythical heroes like Strahan and Brady who perform Herculean feats, or the pilgrimages that fans take to the stadium on game day, hold the same significance as any other liturgy. As the mechanics and technologies for storytelling evolve, it presents an opportunity for new business models to emerge, Sankaran says. And Brady, Strahan and Chopra are already taking advantage of new mediums for developing and distributing the stories they want to tell. There’s already the Religion of Sports series on The Audience Network and the blockbuster success of the company’s latest endeavor — the Facebook-distributed (and pretty masterful) Tom vs. Time series. The series already racked up more than 42 million views on Facebook — a little more than one-third of the total viewership of this year’s Super Bowl — and additional projects like Why We Fight (with TechCrunch’s parent-parent company, Verizon) and one currently in production on the 2018 NBA Draft should also rack up the views. In some senses Religion of Sports is trying to upend the idea of a network in the same way that Players’ Tribune has. The internet has given a means for any group equipped with enough of a following and the means to produce quality content to set themselves up as a new take on the ESPN model. You don’t need a “channel” because the site and its attendant mobile app are the channel — existing alongside other methods for distribution. Storytelling has become about format (long form versus short form) rather than the screen on which it’s presented. And companies predicated on storytelling won’t replace traditional networks and other outlets, but work with them from a position of power and exist alongside them. Brady says that new challengers are definitely going to emerge, and that he wants his shot to be among them.